Growth in ways we aspire to…….some may and some may not aspire to all of these ideas. He had to have 2 major back surgeries for congenital scoliosis. One landed him in the hospital for 3 weeks with a staph infection. He was told he wasn’t good enough to even try out for the select team at the field we originally played at. He was cut from a team because they wanted a centerfielder, and their chosen centerfielder came with a friend that played Eric’s position, first base. Eric was out. He was told by his high school coach that even though he was one of his best hitters he wasn’t planning on playing him. We transferred schools his senior year in high school to give him the opportunity to prove himself. He wanted baseball bad enough to do anything to play it. 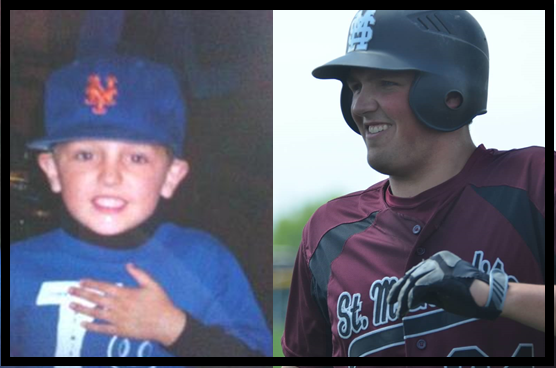 After a great senior season, Eric ended up receiving a college scholarship to play baseball at Harding University. Just remember if you love something enough, and work hard enough at it, you can achieve it. Take a look at this video about Famous Failures and keep reaching for your goals! This entry was posted in Inspiration, Personal Growth on February 27, 2014 by Vivian. This elegant treat looks so fancy and tastes divine. It is SO EASY to make, so I need to share it with you (it IS Sagepointers’ goal to give the best ways to save time and enhance your life). 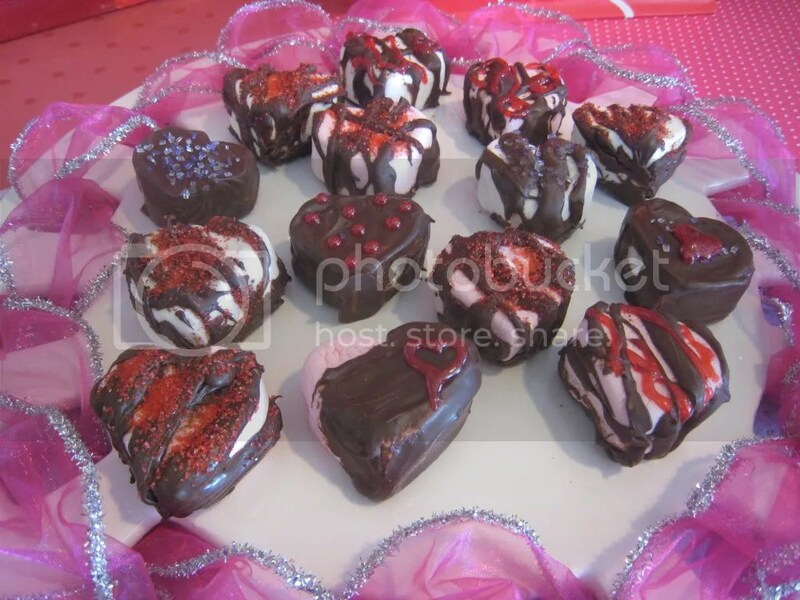 Chocolate-drizzled Marshmallow Hearts are perfect for Valentine’s Day parties, and so pretty to present as gifts to neighbors, friends, coworkers, teachers, grandparents, and even your own special Valentine. I made a batch for my son’s school Valentine’s Day party (see photo above). I am a room parent for my son’s class, which means I am in charge of planning their party (which I organized with my free sign-up sheet on www.sagepoint.com, of course). I still wanted to contribute something special but did not have time to bake. Perfect! A sheet of wax paper. A bag of Campfire-brand pink strawberry & white vanilla heart-shaped marshmallows – Cupidmallows (I found them at Wal-mart). Wilton “Sparkle Gel” decorative icing in red sparkle (purple and pink would be great, also). This is found in the cake & cookie decorating areas. Also find it in craft stores. Assorted Valentine’s Day sprinkles. I used red sugar sprinkles, and coarse purple and white (clear) sugar sprinkles. A pretty serving platter. The one I used in the photo is the ‘Dress Me Up Platter’ from Southern Living at Home, wrapped in hot pink ribbon. Presentation is important: Save the white paper plates for hot dogs. 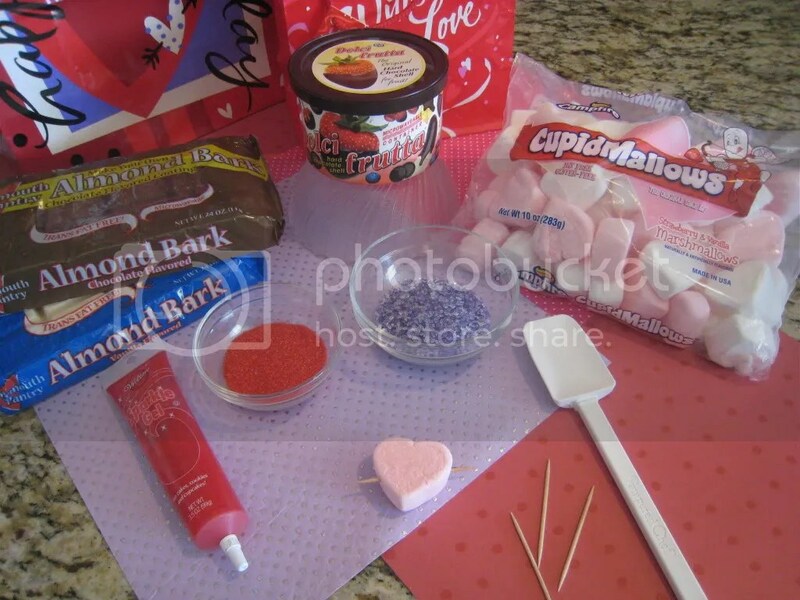 Open bag of marshmallows and spear each one that you are planning to “chocolatize” diagonally with a toothpick (Cupid’s arrow style). Note that I have an example in the center of the ingredients photo seen below. Meanwhile, follow manufacturer’s package directions for melting either the Dolci Frutta or the Almond Bark. Pick up your spreader or small spatula and dip into the melted chocolate. Pick up a marshmallow heart by the toothpick, and while holding it over the container of melted chocolate, drizzle tops and sides with chocolate in long strokes. Or, dip ½ of the heart into the chocolate. Or, frost the entire heart with chocolate (you can see examples in my photo). Since your first one may be a little messy, you’ll have to perform a taste test on it and eat it. 🙂 Immediately add sprinkles to the “good” ones, if desired. Or, let chocolate set and move on to dipping your next marshmallow. Once you have the chocolate and sprinkles on all of your hearts, add decorative details with your Wilton “Sparkle Gel” decorative frosting. Add dots, mini hearts, squiggle lines, or short words like “love”. This special sparkle gel is very pretty but will remain a little sticky, so don’t put your fingers in it or stack your marshmallows as it may ruin your masterpiece and create another taste-test opportunity. Make every one different. You want them to look unique and hand-made. Once the chocolate sets (which happens in 10 minutes or less), gently remove each heart from the wax paper and remove the toothpick. Or, if you are crafty and have the time, turn that toothpick into Cupid’s arrow and leave it in the heart. Place on a beautiful platter in a single layer and cover loosely with plastic wrap. You may want to store them overnight in the fridge, but serve them at room temperature. I think this recipe would work any time of year. During the Christmas and Winter months you can find snowman-shaped marshmallows. Any other time of year you can use large, campfire marshmallows and let the seasonal colors come through in your Sparkle Gel and sprinkles. I welcome your thoughts & comments. Let me know how you like this recipe. This entry was posted in New Recipes, Personal Growth and tagged Almond Bark, Chocolate, Christmas, free sign-up sheet, Heart (symbol), impressive dessert, Marshmallow, No Bake Dessert, online sign-up sheet, party idea, party recipe, sagepoint, save time, school party, southern living at home, Sprinkles, time-saving, Valentine, Valentine Day, valentine s day, www.sagepoint.com on February 13, 2012 by Vivian. Want to lose weight? Eat healthier? Stop smoking? Spend less money? Volunteer more? Get a better job? Remember everyone’s birthday? Be kinder? BECOME MORE ORGANIZED (see upcoming blogs for wisdom on this)? Many of the resolutions we all aspire to can be achieved through mastering just one thing. And you don’t even have to buy a book to get my secret…….I’m just going to tell you. It is not guaranteed to be easy, and it is not going to be a quick fix. But, it WILL make your life better. AND it will make many, if not all, of your resolutions quite doable. Ready? The SECRET to achieving all of your resolutions lies in the mastery of SELF DISCIPLINE; Control yourself. Don’t overindulge. Do what you SHOULD do, not what you FEEL like doing. Don’t give in. Don’t doubt yourself. Persist in mastering control of what you think, say, and do. You can’t control others, but you CAN control YOURSELF. How do you master SELF DISCIPLINE? Find people who are better at it than you and get their support. Print the above paragraph and put it in a place where you can read it daily as a reminder, or better yet, block and copy it to your online Sagepoint calendar, along with a recurring reminder to read it three times daily. Take what you learn from small successes, and apply the lessons to the bigger goals on your list. For example, I have a resolution to exercise but find that I am too tired during the day. I am going to start by going to bed consistently at 10:30 p.m. each night (instead of midnight or 1 a.m.). I can practice control, doing what I SHOULD do (go to sleep on time) instead of what I FEEL like doing (staying up to work while it is so quiet and I am on a roll). Once I attain this small goal, I will move on to start exercising since I will have more energy from the consistent and routine sleep I am getting. I will be persistent, as I will most certainly fall occasionally, but I know that I CAN control myself and I like how I feel when I accomplish even the small goals. Once I am on track with these goals, I will move onto the next goal on my list according to priority. It’s worth repeating: Control yourself. Don’t overindulge. Do what you SHOULD do, not what you FEEL like doing. Don’t give in. Don’t doubt yourself. Persist in mastering control of what you think, say, and do. You can’t control others, but you CAN control YOURSELF. Ponder the thought for a while…. I CHALLENGE YOU! Print or copy the reminders (Control yourself. etc.). Read them each morning, noon, and evening at meal time. Take one small goal, and retrain your thinking. I’d love to hear what you think. Please, take a moment and leave me a comment. Check out the smart FREE tools at www.sagepoint.com. This entry was posted in Personal Growth, Resolutions and tagged free sign-up sheet, New Year's resolution, online calendar, organization, organizing, organizing tips, secret tip, self-control, self-discipline, sign-ups, signup, signups on December 31, 2011 by Vivian.